Crowdfunding allows students, faculty and staff to secure funding for the projects that matter to them most. 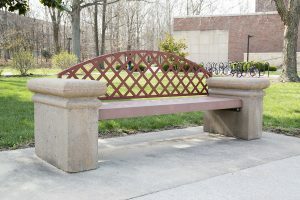 It connects donors to memories of their alma mater, what is currently happening on campus, and creates a sense of community and connectivity for everyone. So who benefits from crowdfunding? Over a year ago, SIU Carbondale began SalukiFunder, a crowdfunding platform that helps SIU students, faculty and staff raise money to make an impact on campus, in the community and globally. 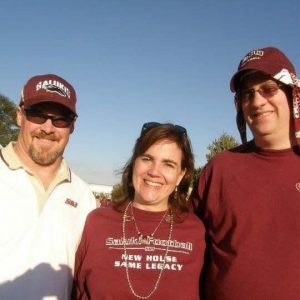 Just recently, a group started a fund to memorialize a longtime friend, SIU alum, and staunch supporter of SIU athletics – Remy Billips. 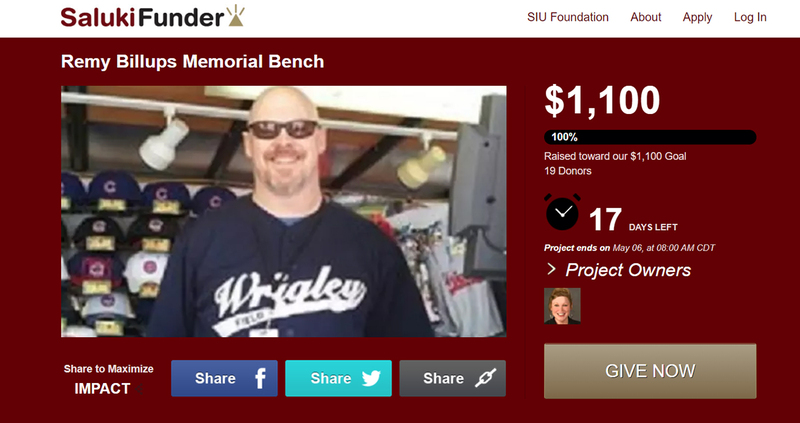 They hoped to raise $1,100 to install a memorial bench at SIU Campus Lake to honor Billips. In less than two weeks, the group raised $1,100, which was the amount needed to purchase the bench and memorial plaque. Remy Billups was a loyal two-degree SIU alumnus who loved his alma mater. From his days as a Saluki Cheerleader and team mascot in school, to serving in leadership roles for the SIU Carbondale & SIU Edwardsville Alumni Associations, Saluki Maroon was in his blood. A devoted sports fan, Remy rooted hard for his Salukis and beloved Green Bay Packers, Chicago Cubs, Chicago Blackhawks & Chicago Bulls. He also held a position in merchandise sales for the latter three organizations: a role Remy truly thrived in. Most important, Remy was a beloved friend to so many. So many of us were blessed to have known Remy and call him ‘friend.’ And quite a few people would refer to him as their ‘best friend.’ His quick wit, humor and good nature made him a joy to be around. This entry was posted in Crowdfunding, Higher Education, Illinois Higher Education, SIU by admin. Bookmark the permalink.